Chuckawalla State Prison artists' book. Various poets and printmakers. Jeri Richards; hand-printed intaglios; Ca. Institution for Women, Frontera; 1994; image size 5"x7"
Marge Tanner; hand-printed intaglios; Ca. Institution for Women, Frontera; 1994; image size 5"x7"
hand-printed intaglios; Ca. Institution for Women, Frontera; 1994; image size 5"x7"
Avenal State Prison; 12"x15" oil on paper; spring 1996; I. Bosch H70921, "Refugee"
Avenal State Prison; qw"x15" oil on paper; spring '96; I. Bosch H70921; "Dreams"
M.D. 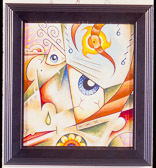 Lujan, c-00556; DVI, "La Vida"
This work was created as part of the California Arts in Corrections program, which was administered by the William James Association. Seen here is a very small portion of the extensive Arts in Corrections archive at the University of California, Los Angeles.